AxumGear can brag about a super amazing design that enables you to have fun with the pairing of the earbuds for a long time. It also has an adjustable look to ensure it fits your ear exactly the way you want it. Makers of this earbuds provide 18 separate sizes of hooks and ear tips, aiding you to discover the appropriate fit easily. With its comfortable and efficient grip, it is also a suitable friend for your tedious workout sessions. As regards its sound, its deep bass is soothing. With a steady 8mm speaker, your top-quality sound is guaranteed. The HD mic it comes with also does a good job at preventing background noise, and that allows you to enjoy your music, hands-free calling anywhere you are. Charging it is not a problem. With its charging case you get to use your earbud for up to one full day. These ones are just quality. Blessed with remarkable sound, the wireless earbud will leave you speechless. It is also waterproof so you can even listen to whatever under the rain or as you have your bath. The 12 hours of play time decent enough to have an amazing time with your music. Two microphones come with it for calls with sublime clarity. It supports Siri and Google Now. They may not battle it out with AirPods when it comes to elegance, but they are effective enough to resurrect any dead music experience. With the in-ear design, they fit your ear perfectly. Its eartips are so smooth and give you the kind of relaxed feel you desire as you use it. There is a built-in mic to ward off background noise and a built-in battery for six or five hours of playtime. The best part is that it comes with multi-point pairing so you and your pals can rock that song together. Black and khaki ar the colors this earbud is available in. This one is for lovers of music. 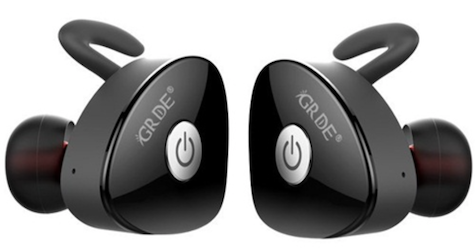 Seen as the most little stereo wireless earbuds worldwide, they were released to add music to your workout experience. By charging once, you get three hours of music playback. It also has a portable charging system, that lets it get charged for up to 15 times. It is water-proof too. With a comfortable design, it is great for adding excitement to your music experience. The earbuds are beautiful and fit the ear, which is a great feature for listening and work out. It also has developed noise reduction technology that provides super clear audio. There is a Built-in heart rate monitor and fitness analyzer which makes it a cool choice for those that want to keep fit. It is water-resistant. There you have it. The best Airpod alternatives for you. These earbuds have features similar to the Apple Airpods, giving you an experience similar to what you will be getting on the Apple Airpods.